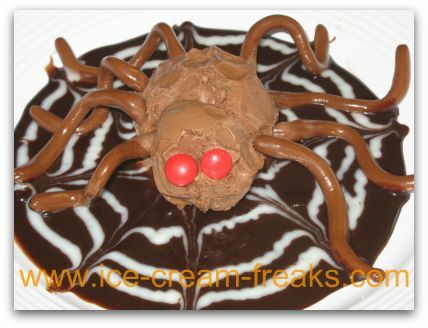 This spider ice cream sundae recipe is a fun treat for Halloween. Prepare the spider legs first, by rolling each Tootsie Roll(R) in between your hands until long and slender. Make sure they are equal in length. (My kids really enjoyed making the spider legs.) Bend them into curvy legs. Set aside. Put some chocolate syrup in the center of a dinner plate that has raised edges. Make a glaze with cream and powdered sugar. The consistency should be about the same as the chocolate sauce. Transfer the glaze into a decorating bag or use a plastic sandwich bag. Snip off a very small corner of the bag. Drizzle a spiral pattern on top of the chocolate syrup, starting from the center and moving outward. 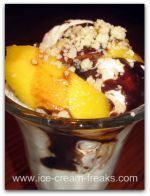 Take a wooden skewer and with one end, pull a line through from the center to the edge of the chocolate syrup. Continue to do this around the plate to create a web pattern. 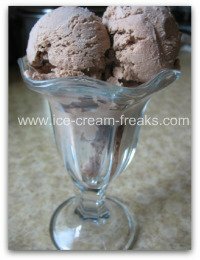 Working very quickly, scoop out a ball of chocolate ice cream and place in the center of the web (for the body). 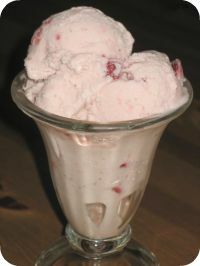 For the head, scoop a smaller ball of ice cream and attach to the body. Poke the legs into the body of the spider. Place the eyes on the head. Let everything harden in the freezer for a couple hours. Pumpkin Jack-o-lantern - Chill a plate in the freezer. Scoop out a large ball of pumpkin ice cream and place on the chilled plate. 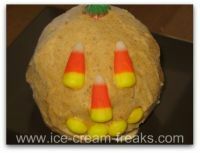 Add candy corn for eyes, nose, and mouth. (Use only the yellow parts for the mouth.) Cut the green top off of a candy pumpkin and place it on top of the jack-o-lantern. Return to freezer to harden until ready to eat it. 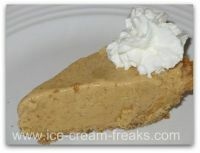 Pumpkin Ice Cream Pie - This pie has a delicious homemade graham cracker crust and whipped cream on top. Makes a great Thanksgiving dessert as well.